The seasons are changing; so should your salad. 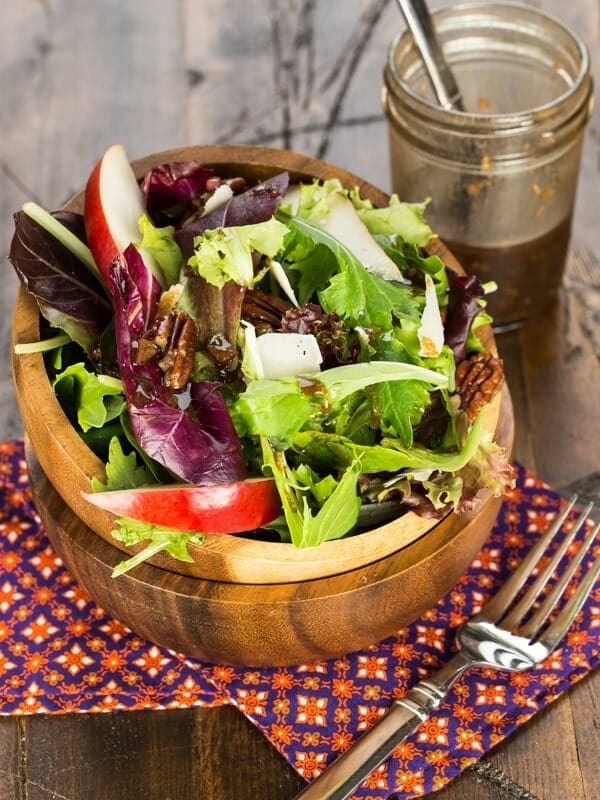 Switch up your routine greens with this Fall Salad with Pears and Candied Pecans. My dad worked late nearly every night when I was growing up. My mom always made dinner for us kids and faithfully put a plate of food in the fridge for him to heat up when he finally arrived home. More often than not, there was also a salad bowl covered in plastic wrap next to the dinner plate. My dad ate the same salad for years. Not because he was a picky eater or because my mom was a bad cook (she’s not; she’s amazing) but that’s what he liked: iceberg lettuce with italian dressing. Maybe a sliced tomato, maybe some croutons to shake it up. But that’s about all the variety he had with his salads. Italian dressing was always a hard sell for me as a kid. The tangy bite made my mouth pucker. Flash forward 30 years, and I’m the one trying to get my kids to eat more greens. How to entice them? 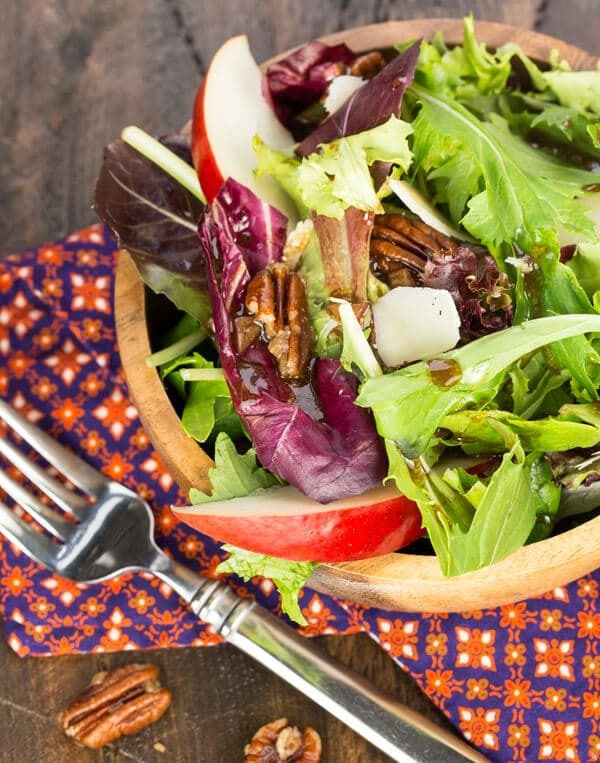 This Fall Salad with Pears and Candied Pecans is a good start. One of the things I love about this salad is it incorporates ingredients that are kid-friendly as well as perfect for fall. The maple syrup adds a sweet dimension to a standard balsamic vinaigrette. The Parmesan brings a hint of salt. Red pears make a juicy and colorful addition. And the candied pecans scream eat me by the handful. Tip: I candied my own pecans (and included the directions below), but feel free to buy them at the store if you prefer. Heat a nonstick pan over medium heat. Add the butter and sugar and stir until melted. Add the pecans to the pan and stir for about a minute. Pour them onto a plate lined with wax paper. Separate the pecans with two forks and let cool. Combine the shallot, Dijon and balsamic vinegar in a small bowl. Slowly drizzle in the olive oil and whisk continually to emulsify the dressing. Stir in the maple syrup and season with salt and pepper. Toss the greens with enough dressing to lightly coat the leaves. Add the pears, pecans and Parmesan. Toss again and serve. You will likely have leftover salad dressing. It will keep in the fridge for up to two weeks. This sounds heavenly. And I could add leftover chicken breast for a fabulous lunch as well!